It is Friday! For today’s post I’ll share a crochet craft my mom is making for her church bazaar. 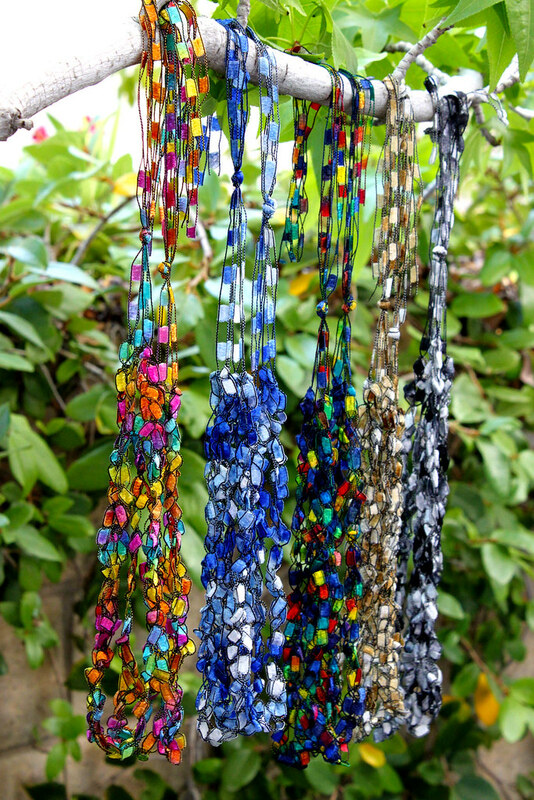 She saw a friend wearing one of these necklaces and asked how to make them. They are very simple. Just single crochet chains of Lion Brand Trellis yarn knotted together and then knotted again at the back of the neck. They can be made any length. My mom made hers with 4 crocheted strands, but some of the other ladies are making them with 5 and even 7 strands. They are really lightweight and a nice summer adornment. They look really pretty reflecting the light. I had trouble getting a good photograph. It was windy outside and inside I couldn’t find a background. I hope you can get an idea of what the necklaces look like from the photo below. This entry was posted on Friday, June 5th, 2009 at 3:00 am and is filed under Craft and Crochet. Tagged: Craft, Crochet. You can feed this entry. You can leave a response, or trackback from your own site. What a treat! These are beautiful!